Let’s discuss how to best collect those stellar EVPs on your next ghost hunt. There are many ways to collect audio, but most in the paranormal field opt for DVR (digital voice recorders.) You can spend any amount of money on one of these, but for the most part a middle range DVR will serve you perfectly well. For the sake of convenience, get one with a USB port. This will make exporting your files to a computer much much easier. This matters if you want to easily share your findings with Aunt Esther in Minnetonka when she disputes your paranormal obsession. Throughout the course of your investigation at whatever locale, your DVR should be up and recording for the most part. You can also attempt to engage any spirit activity at a location by pointedly asking questions of them or inviting them to manifest in any way they choose. Keep in mind, even if you hear nothing at the time, that doesn’t mean there is nothing going on. This is where the tedious chore of audio review comes in. Once you have collected all your video and audio recordings, pack up, and head home; there is still the task of reviewing all the footage for anything that wasn’t readily visible or audible at the time of recording. This can be monotonous but it comes with the job. We all knew there had to be a downside to the constant glamor and glitz that is paranormal investigation. 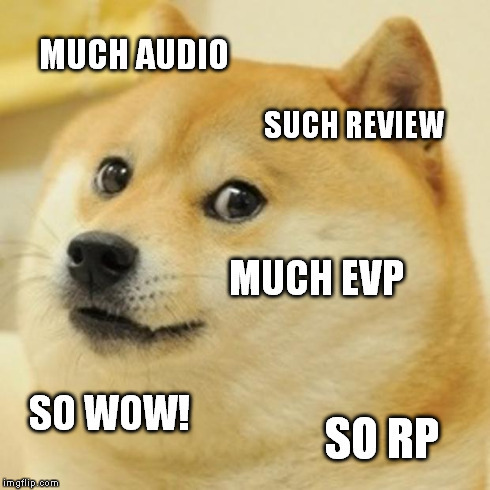 There are three classes of EVP. Type A would be completely clear and legible. This is obviously the rarest type of EVP one will encounter. There second class is Type B and probably the most common type. It is less clear and often there is background noise or masking sounds present, but one can still hear the response with little difficulty. Class C EVPs are ones in which the response can be heard only with great difficulty and are obviously the least legible. So just be ready to sit and listen to hours of yourself asking repeated questions in lots of locations. It is then and only then that you can have the opportunity to garner those EVP’s that will astound you and raise the hairs on the back of your neck. 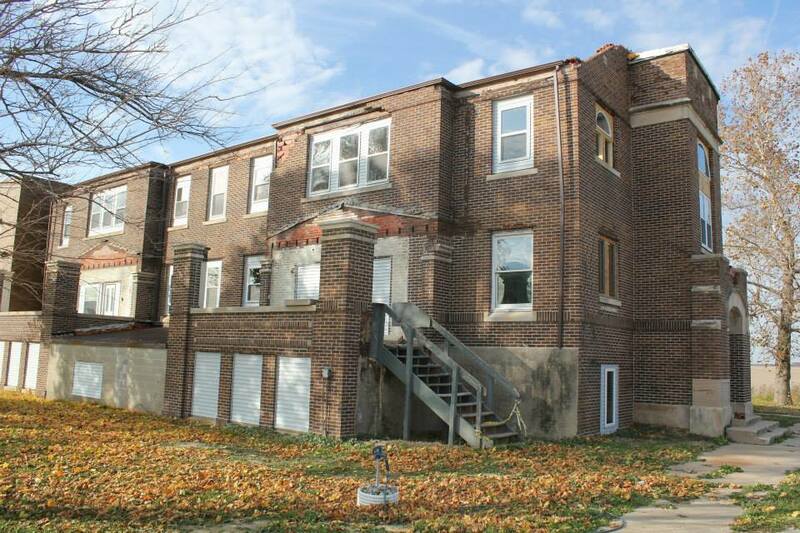 Why do all haunted houses look like this? 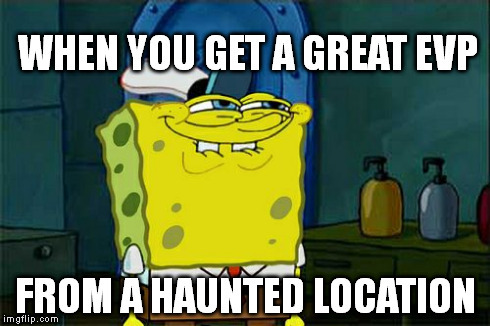 Then your house is probably haunted. Good luck and if you decide to move, you’ll need a very understanding realtor. Ok, maybe kidding a little. Honestly, this image does help to reflect a certain stereotype when it comes to haunted locations. 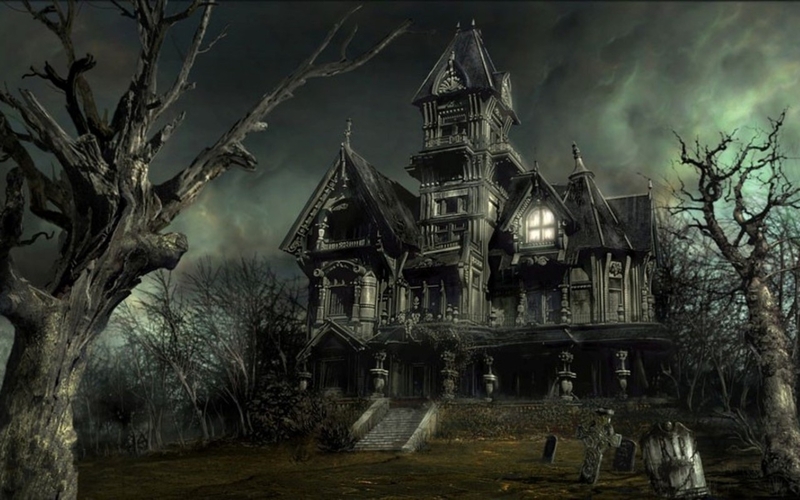 The word “haunted” evokes dark, gloomy, and imposing structures with gothic architecture and creepy darkly lit rooms. It doesn’t sound nearly so imposing if I were to talk about ‘The Haunted Gas Station” or “The Haunted Strip Mall”. Yet, a haunting is simply any location where paranormal activity of unexplained origin occurs. I could have a haunted walk-in closet…SPOILER ALERT: my closet is sadly not a paranormal hot spot. Having said all that, the simple way to determine if you feel your house may be experiencing unexplainable paranormal activity unfolds in two stages. Stage one is when you observe any abnormal and seemingly unexplained activity that seems paranormal. Doors opening on their own, seeing things that shouldn’t be there on the periphery of your vision, or anything else that just seems out of the ordinary. If you feel such activity is occurring in your house, don’t panic. Try to record any of the unusual activity. Another thing you can do, is to try to establish baselines for the occurrences. Do these things happen mainly at certain times, only to certain people, or specific locations? Write your findings down. This will help you during the second step of the process. Now we come to Stage Two. This is where you actively try to debunk any of the paranormal phenomena. If doors or cabinet drawers are opening on their own, you can try to determine if the area is free of drafts, humidity, and any other structural issues that might cause them to open on their own. Hearing strange noises at night? Make sure your house isn’t settling or that your heating or cooling system is not the culprit. Continue trying to actively explain any paranormal activity by logical means. Once you have done this, if you still have occurrences that cannot be rationally explained away, you can operate under the premise that your house may be haunted. This is where a paranormal investigation team comes in. They can come into your house and set up various types of equipment such as video surveillance, K2 meters, voice recorders, spirit boxes and so forth. An experienced team will try to engage any entities through established procedures and record their efforts. Then comes the video and audio review to see if any evidence was gathered. So even if you don’t live in a Victorian estate beside an abandoned graveyard, it’s still very possible that your house could be haunted. If you want more information or have questions, Riverbend Paranormal is always available to help anyone who feels they may be experiencing a brush with the paranormal. Also, I can send you guys some sweet pictures of my non-haunted walk-in closet. You know, a given about being a paranormal investigator is that you are always going to encounter the die hard skeptics. Or in my case, you encounter them, marry them, and suffer a lifetime of dubious looks and long sighs when discussing the paranormal. I’ve met my fair share of believers and skeptics alike. I think its a big world and we’re all entitled to our opinions. This however brings me to one central concept when investigating haunted locations: Evidence, and how that evidence is collected is vital to paranormal investigation. Let’s take this opportunity to walk you through the basic equipment that you need for paranormal pursuits. 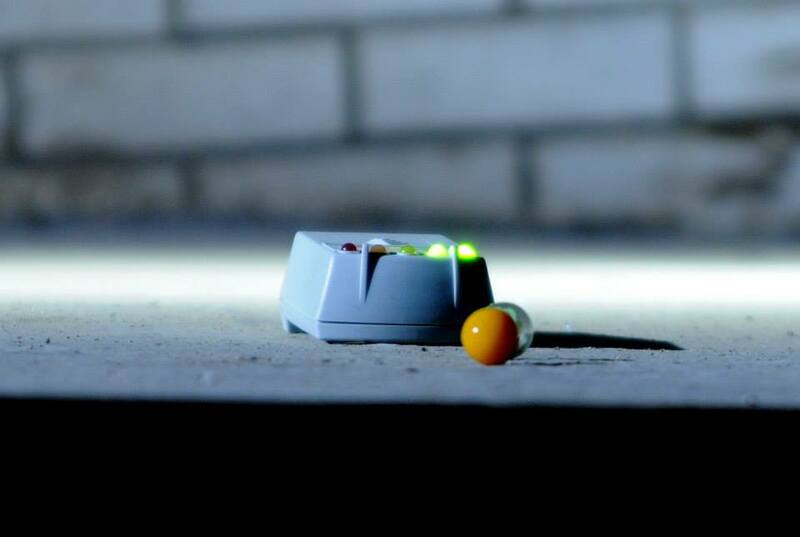 Everyone may differ on what they feel is essential gear for going ghost hunting. Some people bring everything but the kitchen sink because they like to be prepared. That’s okay. I’m a big fan of being prepared. I’m more or less addressing beginning ghost hunters or those who would like to explore the field of paranormal investigation a bit before they invest in a bunch of equipment. The most important thing you need to bring with you on an investigation, you already possess. You should bring a mind that is open to whatever you are about to experience. Notice, I didn’t say you had to believe in the paranormal or that you had to believe in ghosts specifically. If you are going so far as to venture on any sort of paranormal investigation, then it’s almost a given that you aren’t entirely a skeptic. Let’s move on to the more practical side of things. The main objective at any haunted locale is EVIDENCE. That’s the Holy Grail of every paranormal crusade. To begin with, a decent camera and a digital voice recorder (DVR) will suffice. The camera is of course for taking pictures, and the DVR will be used to record you addressing the presumed spirits or entities with questions and requests for activity or communication. Often, people will find that even if there is no visible sound during the recording, inevitably at playback there will be some disembodied voices responding in an intelligent way. This is called an EVP (Electronic Voice Phenomena). So, you’ve got your camera and DVR…it’s go time, right? Not so fast, Spookster. It’s my practical nature, but make sure you carry a flashlight and batteries. Lots and lots of batteries. Not just because your equipment may eat up battery power, but also because its a known phenomena that batteries can mysteriously be drained at a haunted location. There are many explanations as to why this can happen, and we might discuss those later. For the time being, just remember to stock up on batteries and you can thank me later. This is where I act much as your sweet Grandma would. I will now tell you to dress comfortably and appropriately for the weather. Wear sturdy shoes, preferably ones that have the word “ortho” in them. Ok, maybe not that far, but you should remember that many locations are unheated, sometimes abandoned or not currently functional, and that you will most likely be tromping around in the dark aided only by your flashlight. Luckily, it has lots of batteries though. (See above paragraph). Ok, got all the practical bases covered. Let’s move on. Now, I feel like if you’ve seen any horror movies in your lifetime, it goes without saying that investigating all by yourself is not the best idea. Possibly the only worse thing you could do would be to make fun of Jason Voorhees. The primary concern is for your safety, and you’ll most likely be navigating a place you aren’t that familiar with. The secondary concern would be that if you do observe anything possibly paranormal, you can see if you weren’t alone in seeing/hearing it. So grab a friend, or your neighborhood paranormal guy whose name is often cruelly mispelled as BRAIN, and head out to investigate something haunted. If you have an interest in paranormal phenomena and you think it’s something you’d like to pursue, here are some tips to help you on your way. Honestly, the only thing you really need when getting started is a genuine desire to explore the field of paranormal investigation. Now, do you HAVE to be part of a team? No, not at all. You will find however that when you join the company of people who share your curiosity and passion for exploring haunted locations, the experience is greatly magnified. It will also serve to help you learn the ropes by surrounding yourself with people who have some experience in the field. You will also see that by having others with you in the course of your “ghost hunting”, you can often bounce ideas and questions off one another to debunk or validate any phenomena that may occur while you are on location. I will discuss a few things to consider when choosing a paranormal group to align yourself with. A big red flag for anyone would be a paranormal group that charges people for investigations or charges for anything beyond the fees certain locations charge investigators for access to those locations. Paranormal investigation really isn’t for anyone hoping to make a profit from investigating. Those of us who maintain paranormal groups do so simply because this is what we love. Avoid those who do this, and you will be sure to find a group that shares the same motivations you do. Something else to consider beyond these factors, but possibly the most important is whether you feel that your prospective group is a good fit with your personality. If you are in it for the long haul, your team members will be the people that you will spend a huge chunk of your time with both on location and off. Ask yourself: Are these people I would enjoy spending fourteen hours with in a dark abandoned building? If the answer to all these questions is yes, CONGRATULATIONS!!! You’ve found your paranormal team. I’m so very lucky in that my paranormal team is more than just a group of people who share a love of paranormal investigation. We are parafamily. We share our lives beyond the scope of ghost hunting. We celebrate birthdays, promotions, holidays…we pretty much use anything for an excuse to get together. If you can find such amazing people to surround yourself, you won’t regret it and you may find that you’ve made lifelong friends in the process. Greetings from Riverbend Paranormal! This is our new blog to share and interact with all of those within the paranormal community and beyond. My name is Brian, and I am the cofounder of Riverbend Paranormal. I hope to let you all delve further into the whole process of paranormal investigations. When you tell people that you are a paranormal investigator, you’re always guaranteed a quick response of some sort. It may be “the look”. It’s the polite look that also conveys the message that I might be a little off. It may be the enthusiastic reaction where I now have someone who wants to share all their experiences with ghosts or unexplained happenings from their past. I eagerly welcome either of those responses and any other responses I may get. I love exploring this and sharing my experiences with others. The reaction that I don’t get nearly enough is the one where I get to talk about how much my paranormal pursuits involve the rich history of all the locations we visit and explore. It’s pretty standard that when Riverbend Paranormal decides to investigate a location, we try to gather as much background information on the history of the place we are investigating. This is especially true of the larger and older more historic places we visit. 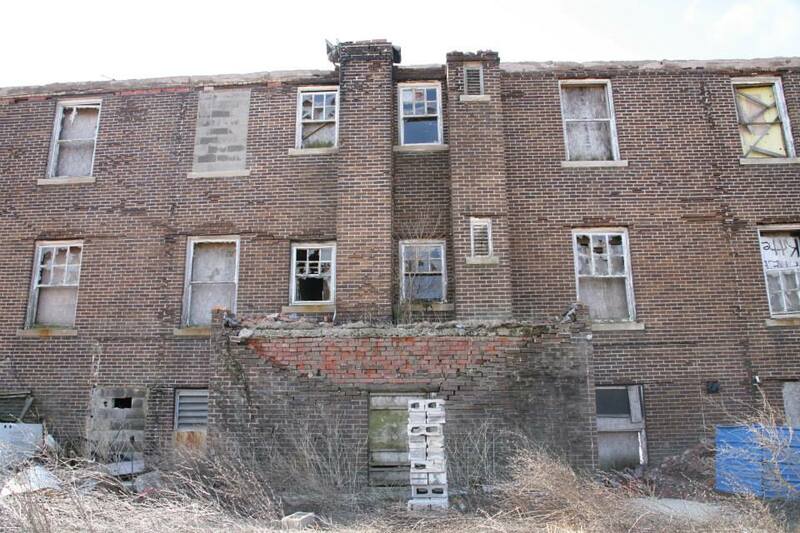 Various places our crew has investigated range from a small private residence to places like Waverly Hills Sanitarium, Villesca Axe Murder House, Zombie Road, and Ashmore Estates. In the course of doing this, we also revisit the history of our towns and cities. We revisit the age of tuberculosis, of times when poor farms existed, and we learn the stories of people long departed. This is something that we take seriously. It almost seems like we are giving places and people from the past a chance to have their stories told and their lives memorialized in a way. I can’t explain the feeling of sitting in a building with over a hundred years of history at midnight in complete darkness and silence. This is a feeling I think everyone should experience at least one time in their life. This brings me directly to our latest investigation. 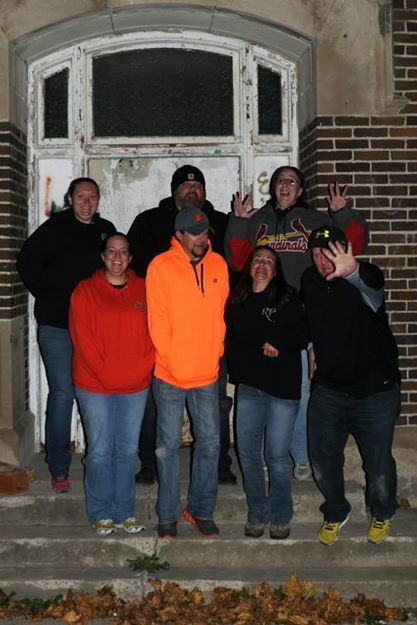 We revisited Ashmore Estates in Ashmore Illinois. Here is the history behind this building per Wikipedia: “This former almshouse, once part of the Coles County Poor Farm, was built in 1916 and operated until 1959, when it was purchased by Ashmore Estates, Inc. for use as a private psychiatric care facility. Ashmore Estates closed in 1987 and stood abandoned until 2006, when it was opened as a commercial haunted house. After becoming abandoned in 1987, Ashmore Estates gained notoriety as a local curiosity and was subjected to trespass and vandalism. Rumors spread that the building was haunted. Riverbend Paranormal investigated this location in 2010 when it was under ownership by Kelley. In the interim, Ashmore was purchased this year by our friend, Robbin Terry. Ashmore had long been left to deteriorate and a lack of windows meant large parts of the building’s interior was exposed to the elements. Robbin began a lengthy restoration project. It was great to see everyone within surrounding paranormal community show up to help in this effort. We got to play a small role in this process and got a firsthand view of how bad certain areas had gotten. Here are some pictures from six months ago to present status of the ongoing renovation. We had our return visit to this historic place on November 8, 2014. It was interesting to investigate in areas that had previously been blocked off or too dangerous to explore. We had a great night and are in evidence review at the moment. I hope to come back and add some of the voice recordings and video images that team members are already telling me sound quite promising. Robbin plans to continue to host investigations at Ashmore. In the meantime, it’s just nice to know that interest from the paranormal community was a big reason Robbin was able to step in and save a historic building from crumbling away into ruins.